The Know-Nonsense Guide to Grammar: An Awesomely Fun Guide to the Way We Use Words! Learn basic grammar principles and literary techniques such as alliteration, metaphors, and hyperbole. Fuzzy on punctuation? Bamboozled by adverbs? Perplexed by the difference between idioms and irony? This Know-Nonsense Guide to Grammar is packed with simple definitions (commas are used to separate words in a sentence and help readers know when to pause), memorable examples (The vampire loves cooking, his teddy bear, and his goldfish. ), and funny illustrations that make the rules of language easy to understand. Turn each page to learn the basic rules of grammar and parts of speech, and discover the literary devices that make good writers great, including alliteration, similes, hyperbole, and much more. 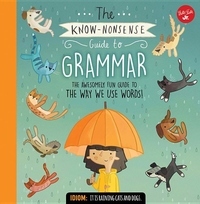 Turning what can at times be dry topics into something approachable and fun, The Know-Nonsense Guide to Grammar is sure to delight readers of all ages. Flex your literary muscles, and soon you'll be a regular wordsmith!